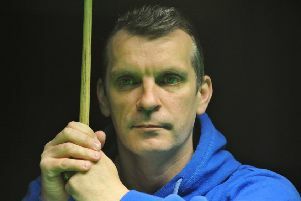 Mark Davis will face Ronnie O'Sullivan in the Welsh Open tonight. Snooker star Mark Davis is set to take on the great Ronnie O’Sullivan in a televised tussle tonight (Wednesday). St Leonards cueman Davis will be out to spring a surprise against five-time world champion O’Sullivan in a Welsh Open second round match to be screened live on Eurosport from 7pm. Although up against one of the greatest players of all time, reigning world seniors champion Davis goes into the best-of-seven-frames encounter in decent form. The world number 31 hit breaks of 77 and 51 in his 4-2 first round victory over Chinese potter Li Hang on Monday and last month fashioned the first 147 of his career to win Championship League group three. Bexhill potter Jimmy Robertson will also be in second round action at the Motorpoint Arena in Cardiff from around 2pm this afternoon. The world number 38 will be up against 115th-ranked Elliot Slessor, conqueror of two-time world champion and home favourite Mark Williams in round one. Robertson produced a splendid comeback from 3-1 down to win 4-3 in his first round match against Indian cueman Aditya Mehta on Monday, knocking in breaks of 101 in frame five and 107 in the decider. Davis practises at O’Sullivan’s Snooker & Pool Club in Bexhill, which is run by Robertson and his family.